It's a busy time for Sheena Rogers Designs in the run-up to Christmas. My gift sets are always popular at this time of year so I added a few extras this year, including coaster sets and keyrings. 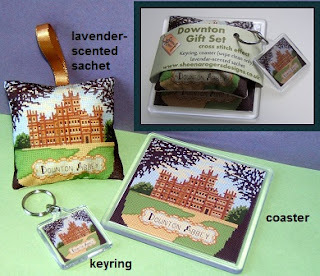 As my Downton Abbey cross stitch kit has been a success I created some gift sets using this same design, including a lavender-scented sachet. I'm hoping to add new gift ideas using my cross stitch designs in the new year too. 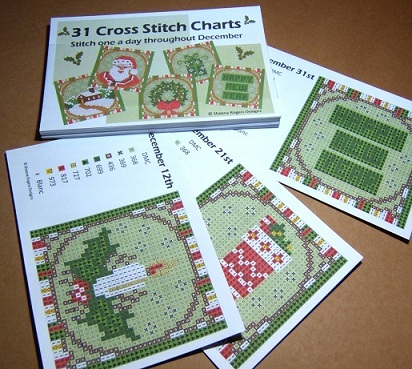 As I love designing Christmas cross stitch patterns I came up with a kind of 'advent calendar' pack which includes 31 charts - one for stitching on each day of December! 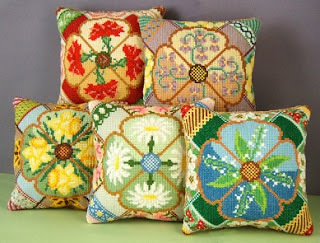 It's been very popular - though I wonder if anyone will take up the challenge of stitching one design a day! Five of the months in my Flowers of the Month range are now available on my website and the new year will see the completion of the series. I've also been working on a tiger design and I plan to add designs that could be stitched for/by males as there seems to be a little gap in the market for these. There'll be many more kits, chart packs and gift sets to come in 2013 so all that's left is for me to wish you and all my customers a very Merry Christmas and a Happy and Healthy New Year.